This week I made a PoC about ADF Desktop Integration. 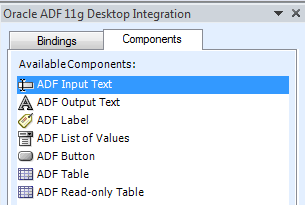 And I think that it is a great tool to work in combination with excel program and your ADF Fusion App. Get LOVs from ADF application and put them inside excel. Providing end users access to data and functionality hosted by a Fusion web application through a desktop interface (Microsoft Excel) that may be more familiar to them. Bulk entry and update of data may be easier to accomplish through a spreadsheet-style interface. End users can use native Excel features such as macros and calculation. I think it is a good alternative to the traditional way we work with excel in our applications. Esta entrada fue publicada en ADF y etiquetada ADF Di por codigoadf. Guarda enlace permanente.